I'm elated today! I woke up to an acceptance email from the AMAZING Susan Opel of Paper Crafts Magazine! Getting into Paper Crafts has been a goal of mine for a while now but I really committed to it this year. And to have accomplished my goal is just mind-blowing! Now, I have to set a new goal and I'm ok with that. :) This year in crafting so far has been my best yet and I'm overjoyed at it all! So, in honor of my joy, I share with you a Pure Joy card today. :) I'm dabbling in a little vintage. What do you think? Paper Crafts seems to think I should be CAS. ;) Anyhow, the bird sticker is from K & Company, isn't it sweet? I also got some yummy Webster's Pages paper. We'll see what I can do with that. The burlap string is from May Arts. The lace is vintage, I got it at the Antiques by the Bay event in San Francisco, a few weeks ago. The flower stick pin is from the Dollar Tree. The button is Jenni Bowling and the felt leaves are from my Caffinated Cropper June kit. Hope you all have a joyful day as well! yea, congrats! I think you should do what you like though, and not what you think a magazine thinks! ;) love the shabby! Yippee!! That is so great, congrats. You do great cards in vintage or CAS. I think you will be fine either way! Congrats! Congrats! Congrats! I'm so glad you reach one of your goals. This card is fabulous and love that vintage look. Perfect card for this celebration. Wow! Congratulations Ashley! This is a beautiful vintage style card. I'm sure you'll achieve whatever goal you set for yourself next...great job girl! Yay!! Congratulations!!! SO excited for you. I saw a card of yours published in one of my other magazines, cards maybe?, & was so happy to see your card. 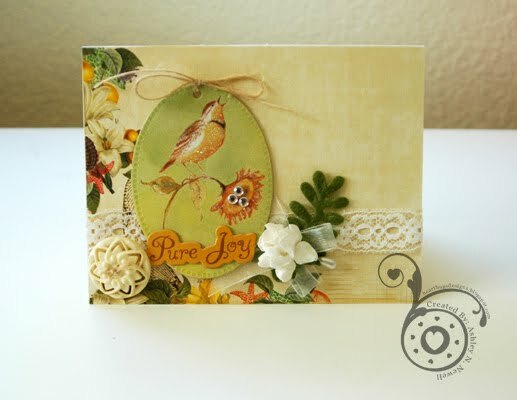 Your card today is gorgeous...love the vintage.